The GI Bills and more is a good website from the Veterans Benefits Administration which attempts to be a one-stop shopping and information site. It now includes a particularly useful School Decision Resources page, which intends to make information and transparency on approved schools more available at one’s finger tips. For example, see the VA’s GI Bill Comparison Tool together with IES’ College Navigator feature (the “more information about your school” hyperlink) and the Department of Education’s College Affordability and Transparency Center. Though the latter is not GI Bill oriented, it is good for finding schools on a regional basis. The WEAMS institution search engine still exists, though now harder to find. It provides in addition to approved institutions, the needed veterans contacts (certifying officials) for additional information, but still lacks a feature to look up by county or region. 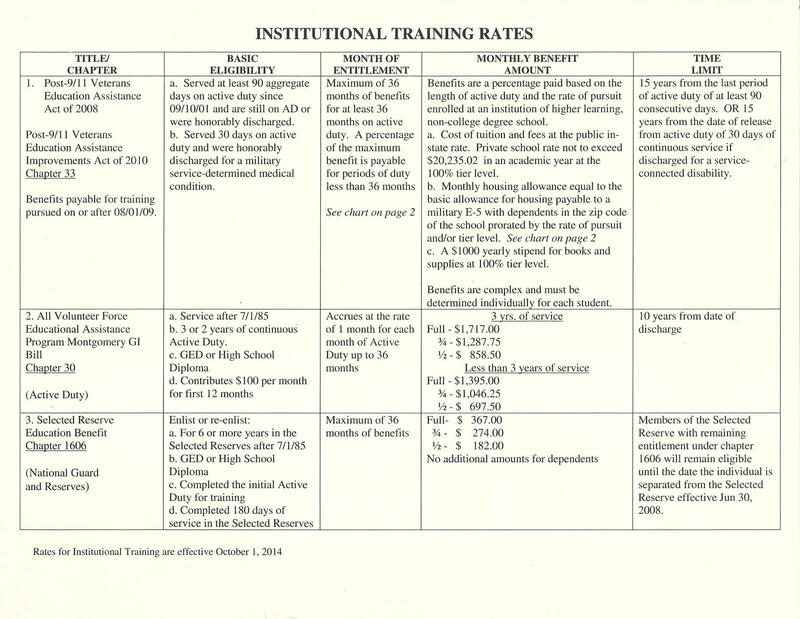 Section 702 of the Veterans Access, Choice and Accountability Act of 2014 (“Choice Act”), requires VA to disapprove programs of education for payment of benefits under the Post-9/11 GI Bill and Montgomery GI Bill-Active Duty at public Institutions of Higher Learning (IHLs) if the school charges qualifying Veterans and dependents tuition and fees in excess of the rate for resident students for terms beginning after 31 December 2015 (originally 1 July). In Pennsylvania and effective 1 July 2015, the one-year residency requirement to receive the in-state tuition rate at a public institution of higher leaning in Pennsylvania has been officially waived through the enactment of Act 11 of 2015. It amended Act 287 of 1982 by requiring community colleges and state related/state-owned institutions to provide in-state tuition rates for veterans, their spouses and dependent children wanting to use their GI Bill benefits regardless of how long they have resided in the state. (1) 10 U.S.C. Chs. 1606 (relating to educational assistance for members of the selected reserve) and 1607 (relating to educational assistance for reserve component members supporting contingency operations and certain other operations). (2) 38 U.S.C. Ch. 30 (relating to all-volunteer force educational assistance program). (3) 38 U.S.C. Ch. 31 (relating to training and rehabilitation for veterans with service-connected disabilities). (4) 38 U.S.C. Ch. 33 (relating to post-9/11 educational assistance). There is no three-year time limit from date of discharge associated with it, as there is in the Choice Act. One other interesting provision is a community college, public institution of higher learning or state-related or state-owned institution of higher learning shall charge resident tuition rates to any active military personnel and their dependents who are taking college courses or receiving other education services through the Internet or by other electronic means. FederalStudentAid, which replaced the excellent Students.gov site in October 2011, is a great “one-source” resource for finding scholarships, GI Bill information, and more all in one place. It gets around the personal information issue that some *.com sites present. Its college finder, College Navigator, can get down to the local area and includes “associate degree” schools, though it is not as complete as the PA Dept. of Education’s site (next section). 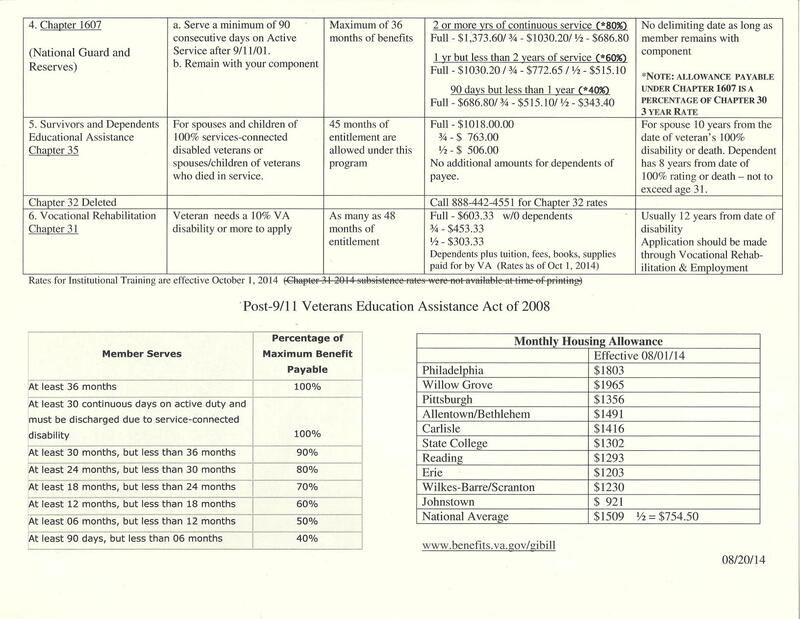 What Pennsylvania Provides: Admittedly, the state’s lack of orientation on veterans and military seeking quick information related to their benefits makes their departmental sites sometimes awkward to use — they have not really improved over the years However, they do provide useful information and do not be afraid to use their search engines, if necessary. The Pennsylvania Department of Education site, while perhaps difficult to navigate and not readily suggesting the department does much for veterans, does provide some useful information and resources. In using it, one might overlook what the Department of Military and Veterans Affairs provides. While it provides little assistance to veterans in general, it has a well hidden Education Services Center for its National Guard and an Educational Gratuity Program for disabled veterans’ children. The Pennsylvania Higher Education Assistance Agency site actually provides some useful information of which few veterans and POW/MIA dependents know (specifically look at the FAQ section in State Grants on the special provision for veterans). Specialized Scholarship Sites: Scholarships for Military Children and the Looking Glass website, which has a primary focus revolving around disabilities, including its own scholarship program are useful sites. The LVMAC Scholarship Program: For those from the Lehigh Valley, LVMAC offers its own scholarship program to support its community military-veterans community. Go to the our Scholarship Program page on our main website for criteria and applications forms. Schools in the Local Area: As noted under FederalStudentAid above and the discussion of its College Navigator, the PA Department of Education provides an excellent subsite for locating schools in your area. So many sites forget trade schools. Not this one. Used in conjunction with the WEAMS search engine, you get a running start at who to contact. You might want to look at LVMAC Academics for Veterans website for schools or the Lehigh Valley Economic Development Corporation website for education, training and employment also. See the previous sections for higher education scholarship providers. Use the Division of Veterans/Military Education, PA Dept. of Education for advice if you are running into difficulties. Call 717-787-2414 and ask for a Veterans Education Advisor, or email RA-VetEd@pa.gov. Remember that the state has its own programs that might be of use, some veteran and military specific. These people ought to be able to help you find your way around. Veterans Advisers at approved schools are also often helpful for general information and definitely should guide you through the process at their school. LVMAC has formed an alliance with willing institutions of higher learning (colleges, universities, business schools, trade schools) to enhance the educational experience of veterans residing in our Lehigh Valley. A website, only one of its projects, is in development, but the intention is that it becomes a one-stop portal to verified information and events relevant to veterans who wish to obtain a higher education in the Lehigh Valley. Click here to enter the site.